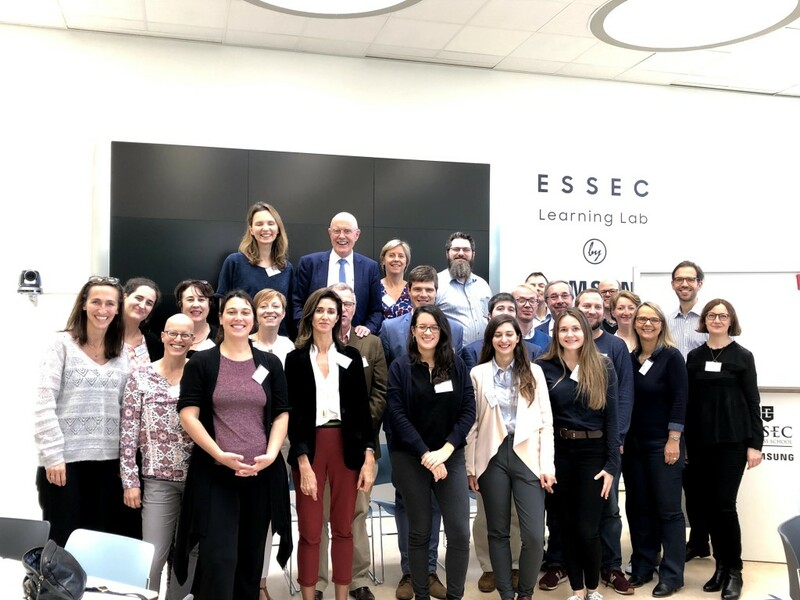 A Gathering of Academic research centers on Philanthropy in Europe (AGAPE) 2018 was facilitated by ERNOP and organized by the Philanthropy Chair at ESSEC Business School in Cergy (Paris Area) on October 18-19. AGAPE brings together leaders from academic centers of philanthropy and their practitioner partners for a series of candid and collaborative discussions regarding the challenges and opportunities in philanthropy teaching and research. This year 27 organizations from 13 countries attended. AGAPE 2020 will be hosted by the Center for Social Investments at Heidelberg University. More information will be available closer to the event date. Half of this year’s gathering focused on philanthropy education and included sessions assigned to different levels of students – from elementary to executive. The second day we paid attention to bridging the gap between academia and practitioners. You can find a brief summary of each session below. This session attempted to create a “mind-map” of the key topics in philanthropy research, and identify the seminal publications that were published for each. The Philanthropy Map aims to serve as an overview of who is studying what related to philanthropy in Europe. The map is structured around 6 first-order questions related to philanthropy: what, who, where, why, how, and what effects?. Examples of second-order questions include: ‘How do foundations engage in philanthropy?’, ‘What is being given?’, ‘What is the definition of philanthropy?’, ‘What role does philanthropy play in organizing societies’? A detailed version of the map will be published through the ERNOP website in 2019. This session, moderated by Georg von Schnurbein from the Center for Philanthropy Studies in Switzerland., started by looking at the challenges of supporting PhD students, including funding issues, recognition of philanthropy as a formal field of study, and the recruiting process. It then discussed new opportunities that schools and ERNOP may be able to provide for PhD students, including exchange visits, PhD workshops, and research opportunities. In this session, Judith Symonds, from Science Po Paris shared her experiences in teaching philanthropy. Afterwards, the participants discussed their courses and challenges in teaching. Discussions varied from the need of a standardized syllabus of philanthropy to ways to engage students in reading their articles. Currently there are no standard readings that are part of every course on philanthropy in Europe. It might be an idea to stimulate the usage of a minimum set of standard readings to make sure we all have a shared understanding of the subject we are teaching. The session also showed that philanthropy courses are part of different curricula, and draws students from multiple backgrounds. This makes it sometimes difficult to position philanthropy as a study in itself. Chaired by Georg Mildenberger from CSI Heidelberg, this session focused on sharing experiences in developing executive education. While all participants were providing executive training programs or are considering to develop programs, only few institutions are able to run the program (financially) successful. On the other hand, financial reasons are only one motivation to set up an executive education program, as it also gives a better understanding of the needs of the professionals working in the field and ways to share your research. Also the need for formal ‘accreditation’ was part of the session, as lack of formal requirements might lead to certificate ‘inflation’. A final note was on the need for a European executive education program. This session was chaired by Arthur Gautier from ESSEC Business School. In 2017, the ESSEC Philanthropy Chair launched a Massive Open Online Course (MOOC) on Coursera about philanthropy in French. The MOOC serves as an example of what the future of teaching philanthropy could look like, but also shows that investments are considerable. Feedback from participants was very positive and the recorded videos can also be used in other courses. Some of the key observations were that in an online world, content is available anywhere and the professor’s role is no longer is no longer a content provider but is to help students make sense of the immense amount of information available. The professor/s value comes from their ability to select, prioritize, and make sense of data. Also, the students still need professors to act as a “clearing house” for theories, data, and ideas. In this session, Carole Reminny from L’école de philanthropie presented the idea of a school (program) were you can learn philanthropy. Philanthropy is, as a concept, sometimes difficult to grasp by primary school teachers and their classes. L’École de Philanthropie is a program aimed at primary school children that stimulates these children to think about their philanthropic attitudes. By means of discussions, role play and fundraising for a real cause, L’école de philanthropie provides a way of engaging children and making philanthropy a little easier to understand. In addition to education, the AGAPE 2018 gathering discussed key topics in philanthropy: the relationships between academic centres and practitioner organizations, key questions in philanthropy, understanding our collective research, and how to better diffuse academic research to the public. These issues were explored on the second day. Practitioner Panel: What Do Practitioners Need from Academic Centres? One of the aims of AGAPE is to facilitate an exchange between practitioners and academics in order to better serve the needs of the professionals working in the field. Laurence de Nervaux (Fondation de France), Maria Orejas (European Foundation Centre), Alessia Gianoncelli (EVPA) and Nelson Amaya (OECD) took on the challenge to address the question ‘what do practitioners need from academic centres? What became clear in this session is that there is absolutely a need among representatives of the sector to work together with academia, but there will also remain a tension because of different interests. Concluding remarks, we can only strengthen each other if we know each other and meet – more. At the next AGAPE the organization will therefore put emphasis on facilitating and communicating the added value for practitioners to join the discussion. After its success at the first AGAPE in 2017, the second edition of the Philanthropy Tango again lived up to the expectations. The idea is to have all participants talk to all other participants about twelve key questions of studying philanthropy, without starting endless discussions that keeps only few talking about few questions. Therefore all participants were given a card that provides a route that took everyone on a tailored ‘tango-dance’ along important questions about philanthropy, which were written down on (digital) flip overs. At each flip over, one would meet another participant, and would be able to discuss one of the twelve questions. The outcomes of the discussion could then be written on the flip over, which then provided the input for the next dancing couple. Examples of questions that were discussed varied from ‘what is the dark side of philanthropy?’ to ‘what piece of advice would you give to a new PhD student studying philanthropy?’ and from ‘In an ideal world, what would philanthropy look like?’ to ‘What do many philanthropists do that they should stop doing?’. This session featured a discussion with Didier Pourquery, Editor-in-Chief of The Conversation France. The articles from The Conversation are not only published at their own website, but are frequently picked up as content for larger national and international media outlets as well. Thus, Mr. Pourquery discussed how The Conversation can be an excellent platform for Academics to interface with the public and potentially get stories in prominent media outlets. He then went through the process for submitting articles.